Beatriz Cortez and Rafa Esparza, Portal Sur, After Copan, 2017, steel, adobe made with soil from the Americas, south of the U.S Border. 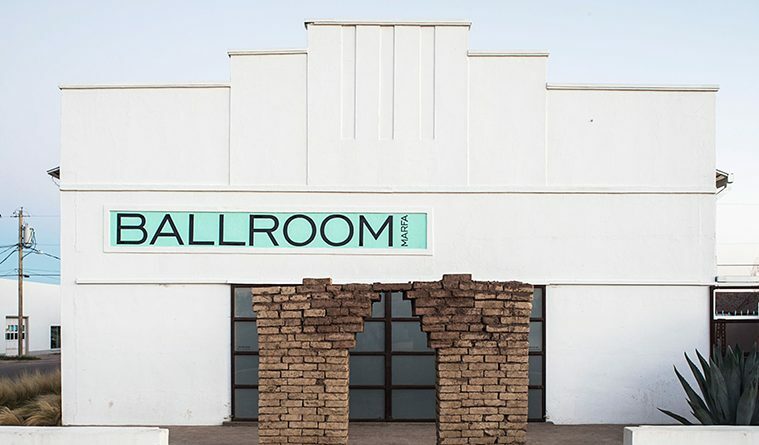 Courtesy the artists, Adobero Don Manuel Rodriguez, and Ballroom Marfa. 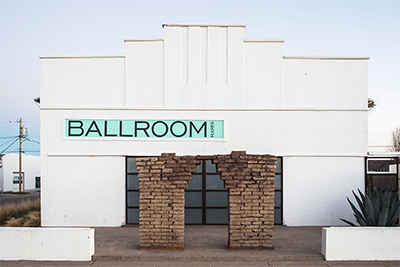 An adobe brick archway made by artists Rafa Esparza and Beatriz Cortez reorients and frames the entrance of Ballroom Marfa for the exhibition Tierra. Sangre. Oro., on view through March 18. Whereas previously visitors would have entered through a door on the east side of the building, we now traverse the gallery north to south, heading towards the border of Mexico. Esparza’s work was included in this year’s Whitney Biennial, for which he and collaborators made adobe bricks in his hometown of Los Angeles and shipped them to New York. Similarly, for the Ballroom installation, he brings physical aspects of one place to another. Over 2,000 bricks for Tierra. Sangre. Oro were made by Don Manuel Rodriguez, an expert adobero in Ojinaga, Mexico, and brought over the border for the exhibition, which includes artworks by Esparza as well as Carmen Argote, Nao Bustamante, Timo Fahler, Eamon Ore-Giron, Star Montana and Sandro Canovas, Maria Garcia, Ruben Rodriguez. Several works impressed upon me Esparza’s idea of a “brown laboratory.” In the first gallery is his Coatlicue 1-4, an arrangement of four towering, self-supporting adobe brick walls, on which are mounted Star Montana’s oversize photographs of female-identifying people. Viewers must face and approach the portraits, then walk around or in between the walls—seeing their construction and feeling their presence—in order to continue through the gallery. The presence of the supporting adobe walls is not merely visual; there is a subtle, cool temperature shift when standing close by, and a gentle scent of raw material. Upon entering the Center and Hallway galleries, visitors are once again asked to engage with materials, walking on an adobe brick floor, negotiating its sturdy-yet-uneven surface. The floor rises above the threshold of the conventional entrance. Esparza has literally elevated the artists and their works, creating spaces for them within the gallery walls; offering brown where often there is usually only white. Carmen Argote’s Hunting and Gathering is an installation of cardboard and pastel colored papier-maché boxes, created by collecting shipping boxes from Marfa residents. Covering one wall is a massive muslin curtain-like painting of wide brown crosses which refer to the shape created by the body of a box with open flaps (which are adhered to the wall behind the muslin) as well as personal and universal interactions and icons. The cardboard boxes are disposable, recyclable, and most likely moved commodities, or perhaps care packages, across borders. The muslin waves in the cross-breeze created by visitors coming in and out of the Ballroom courtyard, where additional works are on view. In the South Gallery is Soladera, a selection of works by Bustamante that speculate about the experiences of Mexican female soldiers. I felt uneasy looking at one of the artist’s yellow Kevlar Fighting Costume dresses stuffed and laid out on top a stack of adobe bricks, seeing the waist-high adobe platform as a place of sacrifice or burial. A curious yellow ringlet (was it blond hair, or maybe frayed Kevlar?) was caught in the buttons and brooch, with bullets and lace gloves placed next to the dress. Together with the over-acted reenactment in Bustamante’s film in the back gallery, the elements read as signifiers of the truth and fiction surrounding these women’s lives. Bustamante’s stereoscopic video titled Chac-Mool, the title a reference to pre-Columbian Mesoamerican sculpture, shows Leandra Becerra Lumbreras, the last known survivor of the Mexican Revolution, said to be the longest-lived person in history (she died in 2015 at 127 years of age). Small and thin, she reclines while fiercely clapping and drumming on a tin sheet, intermittently shouting words I could only interpret as those of revolution. I could not help but relate her repetitive hand motions to the dynamic shapes of Argote’s boxes, the thousands of adobe bricks, and history’s inexcusable habit of forgetting.